After flooding the planet with its iPhone, iPad and other Mac products, Apple decided to tackle both content and services industries. On the menu, a new kind of credit card, but also a service that could compete with Netflix, a kiosk to read newspapers and magazines, among other services. On Monday, Apple held its spring keynote from its headquarters in Cupertino, USA, and rather than introducing new devices, as usual, this event was an opportunity for the company to focus on content. Apple unveiled new services, with a credit card under Apple Pay, but also a physical card, exclusive series, and films as well as a pay-per-view purchase of many third-party services and channels, and finally a subscription to many newspapers and magazines. The card offers a cashback system, which allows you to recover 1% of the amount spent using the physical card, 2% of expenses made with Apple Pay, or 3% of purchases made at Apple. Of course, the Apple Card being a credit card, it will be necessary to refund the amounts spent. For this purpose, the Apple Wallet application offers a simple interface, with the total due and the quantity of interest, decreasing according to the total refunded. Apple uses the machine learning to categorize expenses, and a simple press displays the exact location of the payment in Maps. Apple Card will be launched in the United States this summer. Apple has unveiled two new developments in television. First, a new version of the Apple TV application, which integrates its new Apple TV Channels service. The latter provides access to a range of channels but also to video-on-demand services. It will allow you to subscribe individually to channels, rather than to third-party packages. The offer includes services such as HBO, Showtime, but also Amazon Prime and Hulu. The second new feature is the launch of its video streaming service, called Apple TV+. It will be exclusive content, like Netflix. Apple TV+ will work with a monthly subscription, and movies and series will be streamed or offline. The firm is keeping the exact nature of the content secret for the time being and has not yet announced any titles. Nevertheless, Apple has gathered famous names such as Steven Spielberg, J.J. Abrams, Jennifer Aniston and also Reese Witherspoon. Apple will launch the service this fall in more than 100 countries and, rates are still unknown. The latest new service announced is a “News Netflix” for iPhone, iPad, and Mac. For only $9.99 per month, Apple News+ offers unlimited access to more than 300 press titles. The offer includes publications such as the Wall Street Journal, The Times, Los Angeles Times, but also Vogue, Rolling Stone, National Geographic. According to famous analyst Ming-Chi Kuo, Apple could equip entry-level computers with ARM chips as early as 2020, eclipsing Intel x86 processors for the first time in their history. This shows how serious Apple is with controlling their whole production line! Are the days of collaboration between Intel and Apple numbered? Apple Insider claims to have had access to an investor rating from analyst Ming-Chi Kuo, an expert recognized for the accuracy and precision of its information. In this note, which refers to the privileged relationship between Apple and the founder of Taiwan’s TSMC processor, Ming-Chi Kuo states that TSMC will produce the A13 (2019) and A14 (2020) chips and that the latter will be the first chip to be integrated into entry-level Macs. ARM’s arrival in Macs will be this time for 2020-2021. However, it is important to note that Bloomberg revealed in April 2018 that it was aware of a project called Kalamata, aimed at initiating a complete or partial transition to Macs towards ARM chips from 2020. Therefore, there seems to be a set of concordant elements. Ultimately, what will determine this transition from Intel processors, which replaced PowerPC chips on Macs starting in 2005, is the overall performance level of their chips compared to ARM chips. We know from the example of Always Connected PCs, computers running Windows 10 with an ARM chip, that the task is complicated. Throughout the “PowerPC” years, Apple also compiled macOS on x86 to measure, in each generation, the relevance of this platform, which allowed it to be prepared to switch to x86 chips. At the moment, only Apple engineers who have undoubtedly been compiling macOS code on internal ARM platforms for some time know whether the performance/watt ratio of the Ax chips is interesting. But the current context seems favorable. Besides the unification of the iOS and Mac OS applications (Marzipan project), whose tools will be available to developers in 2019, it is the lack of innovation in the output roadmap of the Intel processor which, just as at the time IBM abandoned the PowerPC, could decide that Apple change crematorium. According to Ming-Chi Kuo’s report, in addition to controlling the hardware/software pair, converting x86 to ARM would allow Apple to reduce manufacturing costs better and possibly offer cheaper products – hypothetically, of course. And Ming-Chi Kuo pointed out that this conversion could scare away some professional customers losing virtualization functions of x86 chips. In addition to these predictions from information about the nature of the Apple/TSMC partnership, the analyst’s report also includes a reference to Apple’s automotive project. The Apple Car, whatever its form (onboard computer? a real complete car? ), according to him, would carry a chip recorded by TSMC and would be launched between 2023 and 2025. It is, at the earliest in five years, an eternity in the world of high technology. By then, we will have had time to check whether Apple has done it or not, at last! – To its processors on Macs. See you in 2020. Web hosting is something that you have to look at because you need a website for your business. The problem that many people and small businesses find is that web hosting may not be as affordable as they assume. There are many affordable choices on the market if you want to use a server working on Mac, but you need to know what to look for and how to determine if the price is right for what you are getting. There are a lot of people who make the mistake of choosing the cheapest option on the market. They assume that this will make it more affordable and that they will be able to offer them everything they need. This is generally not the case as it is very rare to find a cheap web host that is also fast and reliable. The very cheap web hosts will generally sacrifice some of the speed and reliability that you need for the costs. While you will be paying less with these companies, they are not going to be overall affordable. This is due to the fact that the slow speeds and an unreliable connection will result in your website being down more often and visitors leaving as it takes too long to load. Here is a liste hebergeurs site web pas cher! The web hosting plan that you feel is affordable might not actually be right for your website. Many of the bargain hosting plans out there will have slow speeds. They will also not offer you the best support and you will suffer from downtime errors. You will also need to consider the security of the hosting that you get and the number of people using the same server as your website. The more websites are placed on the server, the slower your website will be. There are many businesses that will benefit from dedicated hosting and this is not what you will be getting with the cheap options. The most affordable options will generally offer shared hosting. This means that the server will be shared with other businesses and this could slow down all the websites. However, if your website is not extremely large or dealing with sensitive data, you might not need a dedicated server yet. When you look for affordable hosting, you will generally read reviews to see what other people have to say. The problem is that not all these reviews are as biased as you might imagine. The sites that offer lists of the best web hosts and the most affordable web hosts might be part of an affiliate program. These websites will be paid when someone signs up for a hosting plan whether it is right for the user or not. It is recommended that you look at reviews on forums and other third-party review websites. If there is a link to the web host, the person posting the review could be an affiliate. Forums will generally offer you the best reviews and will help you determine if the web host is the right option for your website. Samsung, Apple and LG will make you use your smartphone as a car key! Smartphones will soon be enhanced with a new feature: the ability to be used as car keys. Indeed, several large firms will propose a first unified standard to dematerialize keys, called Digital Key 1.0. Smartphones will be enhanced with a new feature that should make them even more indispensable in everyday life. Indeed, several major companies, including Samsung, Apple, LG, but also Volkswagen, Audi, BMW, General Motors and Hyundai, will launch Digital Key 1.0. Your car keys soon dematerialized on a smartphone. It is a device that will allow you to dematerialize your keys on smartphones, via a unified standard among all the companies participating in this project. They have thus come together in a collective, the Car Connectivity Consortium. With Digital Key 1.0, you will be able to open your car, but also your office or home through these virtual keys. Moreover, on the Consortium website, it says that Digital Key 1.0 “provides a standardized deployment method that allows vehicle manufacturers to securely transfer a digital key implementation to a smartphone, using an existing Trusted Service Manager infrastructure. One of the objectives of this consortium is also to make the system as secure as possible, mainly because of the stakes. Digital Key 1.0 will be based on NFC, which already exists on most smartphones, which should facilitate its deployment. We are in any case only in the early stages of the device, since a second version of the device should see the light of day at the beginning of 2019. This time it will be a question of standardizing the authentication process between the car and the smartphone. Away also to enrich the possibilities of the standard, following the example of Tesla or Audi. In any case, the project seems solid, since the consortium includes no less than 70 firms and not the least. This is what the CCC stressed, stating that these different companies “represent more than 70% of the automotive market” but also “60% of the smartphone market”. Are Macs Still Safe for Viruses in 2018? For a long time, Macintosh devices were considered safe from security problems. The worries were for Windows. However, unfortunately, things have changed over time. The Mac weighs more and more heavily regarding market share and is, therefore, a more attractive target for hackers. Moreover, the vectors of attack have also evolved considerably. The old virus is a has-been in 2018. Although Apple is sometimes criticized for this, it takes security issues more and more seriously. But the Mac is no longer that haven of peace it once was. Statistics compiled by security researchers from the CVE Details database attest to this. In 2017, the number of vulnerabilities detected increased by 28.83% over the previous year. This term includes loopholes potentially exploited for malicious purposes that can lead to denial of service attacks, memory corruption, and code execution. In the worst case scenario, all this means that a malicious person can remotely execute a malicious program on your computer and take control of it. This access allows him for example to consume part of your resources (and yes the power of the Mac can make unexpected envy ! ), either to undermine cryptocurrencies, or to launch attacks on a large scale with your ‘help’, or to have your identifiers to carry out various actions on your accounts or towards your contacts. Cyber threats are a thriving business. It must be said that it is still much simpler and more convenient to launch a cyber attack behind your keyboard than going to rob a bank. So from this point of view, some statistics are not reassuring: 40% of denial of service attacks discovered last year received the critical “label.” In other words, they could be activated remotely. The number of code execution vulnerabilities jumped 34% in one year. To make matters worse, half of them were likely to be executed remotely. In such scenarios, the various macOS protection mechanisms can be easily bypassed. The idea is not to be catastrophic, but all these figures show that macOS is attracting more and more interest from cybercriminals. Unfortunately, adware, Bitcoin miners or ransomware are not exclusive to Windows. This solution offers three innovative features. First of all, an autopilot mode so you can live freely in your digital world without worrying about these security issues. The software takes care of everything, permanently, in the background, and especially without slowing you down in your work. Another exciting thing: Bitdefender Antivirus for Mac has Time Machine protection, which improves the security of your backups and prevents a malicious program from encrypting or even destroying them. Finally, Bitdefender includes a VPN, which ensures complete online anonymity by encrypting all incoming and outgoing traffic. Thus, it is no longer possible to spy on you during your exchanges. On the other hand, it may also allow you to access content and services accessible only in certain parts of the world. The Chinese manufacturer DJI, which in a few years has become one of the leading companies in the UAV sector. They recently unveiled a new ultra-compact drone, the Mavic Pro Platinum, a device designed to counter GoPro’s Karma. 4K stabilized, Full HD video return, foldable, lightweight, able to avoid obstacles, 65 km/h maximum: the Mavic’s strengths are too many to list here. But DJI’s Keynote, right in the heart of Manhattan, was also the occasion to attend a new love ballet between Apple and the Chinese company. All the demos of the Mavic were done with an iPhone as controller; with the DJI GO app installed on the iPhone. A Mavic Pro Platinum demonstrated the new Gesture function, thanks to which a simple movement of the user’s arm is enough to trigger a selfie remotely (the Mavic Pro can also output RAW shots in 12 MPx). And just like the launch of the DJI Phantom 4, the new Mavic Pro will only be available for sale via the manufacturer’s website… and in some Apple stores. Apple store employees will even get training sessions. This imaging strategy is already a success: DJI has built up a solid reputation in the sector’s heavy goods vehicles, and can even afford to sell its drones at substantial prices: 1600 dollars for the Mavic Pro and 2200 dollars for the complete pack (with additional battery and propellers, transport bag, etc.). With this new Platinum version, it seems that DJI has set out to improve its best seller that is the Mavic Pro, it is true that this small folding drone does not have a lot of negative points except that it is not equipped with a 4K 60 FPS camera. But DJI did not decide to reinforce this characteristic of the Phantom 4 but rather decided to improve the range and noise generated by the device once again. To reach an autonomy of more than 30 minutes, it seems that DJI has worked on a new aerodynamic strategy by changing some parameters on the engines (even if they remain the same as on the classic Mavic Pro) as well as on the propellers which have changed their style. There are acquisitions that are duly confirmed as was the case with the wireless recharging specialist PowerbyProxi, and others for which the manufacturer is more discreet. According to Image Sensors World, the Apple bought InVisage, or at least it would have offered itself the services of several of the talents that make up this Newark, California-based company. The operation would have been conducted in July of this year. Several InVisage employees have joined Apple, while others are looking for work. InVisage was created in 2006; the company is at the origin of a technology designed to improve shots, particularly in HDR. The QuantumFilm light-sensitive layer developed by InVisage optimizes the light pick-up of these sensors. Objective: to obtain “extremely detailed” images, regardless of light conditions. One can easily imagine what this technology could bring to future iPhone and iPad, if Apple wanted to integrate it into its products. Even an extraordinary computer like a Mac also needs regular cleaning like other PC. Considering that cleaning Mac manually is a complicated task, and almost impossible for beginners. So to improve performance and speed up your Mac so easily and practically, a decent software is required. You will get 4 Mac software to clean in this article; you can try them to remove unnecessary files. It helps you eliminate unnecessary files and documents that clutter your Mac, and free up more free memory on your Mac. It removes unnecessary language packages to free up more disk space. It is capable of removing unused files generated by Internet browsing and applications. MacClean is a powerful Mac cleaning App; it allows you to clean your Mac professionally and without any loss. After scanning for a few minutes, the program locates all the files and displays a full scan. You can preview the items you want to clean by clicking View Details. Based on this detailed list, MacClean will clean up the unnecessary files stored: cache, cookies, browsing history and residual applications you have uninstalled. Also, the nine tools can satisfy all your cleaning requests. In short, with MacClean, you can optimize your Mac, free up disk space and get rid of all those unnecessary files that you have accumulated for a long time. – Clean up unnecessary files on your Mac such as user cache files, user log files, system log files, broken preferences, iOS software update packages, and more. Accelerate your Mac computer by removing unnecessary files from it. – Detect large and old files on your Mac. – Uninstall unwanted applications on your Mac. If your Mac computer gets slow, it means it’s time to clean up your device. You can choose one of the tools mentioned above. If you have good ideas about the best Mac cleaning software, feel free to share with us in the comments area. Find more on Mac cleaning by reading ce test complet. By being one of the best computing system in the world, a Mac always gives you a wonderful experience. However, it must happen sooner or later: as the days go by, your Mac tends to slow down in reactivity and performance. If your Mac encounters the same problems and tend to slow down, there are 7 effective tips to help you improve the situation. Each icon is treated as an individual window by the Mac OS X system, so having too many icons on your desktop could adversely affect the performance of your device. If there are a large amount of icons accumulated on your desktop, your mac will roam without a doubt. To improve your Mac, drag the unnecessary icons to the Recycle Bin or organize them in a folder. Some applications like iPhoto use a separate bin, to empty it, you have to look for the corresponding option in the App. Files deleted by emptying the Recycle Bin are always present on the hard drive and eventually make your Mac row. Step 1: Open Finder> Click “Finder” at the top of your screen. Step 2: Click “Empty Trash in Secure Mode”. To improve a Mac, it is necessary to clean them quite often. However, these files are not easy to clean, on the one hand, they remain hidden in invisible system folders, on the other hand, a deletion by mistake will lead to a malfunction of the system. MacClean is designed to help you get rid of unnecessary files to free up more hard disk space, protect your private data and improve the performance of your Mac in just a click. 1. Scan: Download, install and run MacClean> Click the corresponding function button and click Scan. Here, let us take unnecessary system files for example. 2. Clean: After scanning, click Clean to perform cleaning. You can also click Review Details to avoid deletion by mistake. Step 1: Click the Apple icon in the upper left corner of the screen> System Preferences. Step 2: In the System Preferences window, click the Users and Group icon. Step 3: Click the Open button, you will see all the applications that start at startup> Check the boxes next to application to be disabled> Click on the “-” button at the bottom to disable their launch at startup. There are of course many more options to clean a mac and retain its perfomance levels over time, make sure you watch this comprehensive video to learn more ! How many times have you been told that you should have thought about backing up your data? Did you know that there are many solutions that allow you to backup your Mac without you having to worry about it? This simple backup solution integrated with OS X since version 10.5 is the easiest to set up and maintain. It also offers incremental backup capabilities that allow the user to go back up to an X date and retrieve a single file. For this system, you will only need an external USB / Thunderbolt hard drive, a NAS server or a Time Capsule if you are well equipped and a few minutes. Then turn on Time Machine. Leave time to your Mac for the first version. All you have to do is enjoy, backup being done in the background, even if you restart your Mac! For more information about Time Machine do not hesitate to visit Apple support. Bombich’s Carbon Copy Cloner is a disk-based backup and clone solution for Mac OS X. Besides these features, CCC allows the synchronization of folders also called “mirrors”. This function is very useful when you do not want to get bogged down with a full backup, but a true copy of some directories. And even select, one by one, the files not to be included in the backup. It is this last point that makes Carbon Copy Cloner a really powerful tool in our eyes. For example, we can exclude the folder “Film” or only a few films from our backup so as not to clutter the external disk of useless Bluray téras. CCC is available from 38 € 50. Mac Backup Guru is also a relatively simple tool to handle. The software is basic, inexpensive but it does what it is asked. You only have to define the folder (s) to copy, save or synchronize and the software will do the rest. The differential backup method allows the software to analyze your files and their creation/modification dates, in order to save only what could be modified. This will save you a lot of time on every backup. Only negative point for Mac Backup Guru, the complete cloning of the system is only available in the version of the publisher, sold more expensive on their website. The version proposed on the MacAppStore is less complete, but may be enough for some. Managing scheduled tasks for backups. As a way of maintaining your Mac, it is advisable that you clean it once in a while. When you clean it appropriately, it retains the features it had when it was new. However, there are a few steps that will help you while doing the cleanup. It is important to change your OS into the latest Mac OS to enhance its performance as well as speed. The simple manner of restarting your computer helps it in a great way. It is the solution for most of your computer’s issues, which is simply done by restarting. When you have owned your Mac for a long time, you tend to have several apps too. Some of this apps will slow down your Mac’s startup time because they open automatically. Once you have removed those apps from your computer, it will regain its actual start up speed. You can also delete the large files that you have accumulated over time to improve its performance too. Once you have cleaned the internal system, you should also clean it on the outside to ensure that it does not age fast. Start by shutting down your computer and unplug it from the main socket. Using a damp cloth, wipe the outside of it and avoid water in any of its ports so as to avoid damaging its internals. Then clean the screen and the keyboard to ensure they are dust free. If you have exposed your Mac to a lot of dust, it is not possible to get rid of it using the damp cloth alone. In such cases, you can use a blower to blow out the dust that is trapped on the keyboard and the ports. By using the simple cleaning methods, you will greatly improve the performance of your Mac thus making you feel better while using it. Since reports of Apple’s secret collection of iOS location data arose, the Cupertino-based company has remained silent on the matter, not responding to press inquiries despite the fact that numerous government agencies were looking to launch probes into the company’s use of such data. 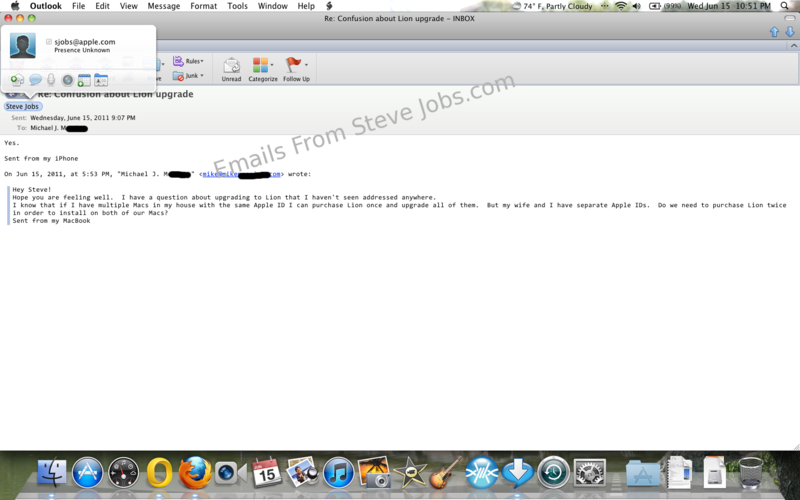 Despite being on sick leave from his position as Apple CEO, Steve Jobs has broken Apple’s silence, issuing a response to an email sent to him but a worried Apple device owner. Oh yes they do. We don’t track anyone. The info circulating around is false. As many sites have pointed out, Google does in fact track the location of smartphones running its software. However, the search giant has been found to limit the number of location entries on the device, purging data when there are 50 records stored. Jobs’ statement suggests that Google uses this information to track its users, whereas Apple doesn’t “track anyone”. The key point is Job’s use of the word “track” – whilst iOS devices are collecting location data and the times the device is pinpointed, the information submitted to Apple is anonymous, which means Apple has no way of tracking a specific user’s location. This data is collected even if the user does not enable location services on the device. UPDATE: As the author of this site, I have some technical back ground and I have inspected the SQLite database file that contains this data. Yes, it contains cell location data in the CellLocation table and yes, it does also contain Wifi location data in the WifiLocation table but all this is old news. This location data has always been around and has been available via the Core Location APIs. What we are looking at nothing more than log files. My guess is that Apple is preparing up a formal statement and will put out an iOS update which will increase the purge time of this data so that fewer records are kept as well as fully turn off this logging if you choose to disable Location data in your iOS device settings. But there is no evidence that Apple is collecting this data and submitting it to themselves (let alone any 3rd party). I found a great write up from an expert in the field who has written a book on iOS Forensic Analysis prior to this recent research announcement. This is mostly anti-Apple FUD campaign. The announcement of this discovery by this particular group was timed for the Where 2.0 conference. Just a big publicity stunt by OReilly media that was blown totally out of proportion. I wouldnt be surprised if Apple sued OReilly media for defamation. It looks like after the recent WWDC announcements Steve looks to be back responding personally to some user emails. What a nice guy! It was great seeing him personally introduce some new things such as the new iCloud features. Emails From Steve Jobs.com reader Mike was kind enough to write in to let us know that he received a response from Steve (in under 15 minutes, no less!) to a question that he had in regards to the new version of OS X Lion. OS X Lion will only be available via the Mac App Store and it was announced that you will be able to install OS X Lion on multiple computers on authorized computers that have your Apple ID. That was a great deal which normally would require the purchase of a family pack for OS X 10.6 Snow Leopard. As Mike found out, you will however need to purchase Lion separately if you use 2 different Apple ID accounts. Hope you are feeling well. I have a question about upgrading to Lion that I havent seen addressed anywhere. I know that if I have multiple Macs in my house with the same Apple ID I can purchase Lion once and upgrade all of them. But my wife and I have separate Apple IDs. Do we need to purchase Lion twice in order to install on both of our Macs? UPDATE, Thursday July 21: OS X Lion is now out and a lot of people are finding this page through Google. To install OS X Lion on multiple computers you can just sign in with the same account via the Mac App Store on different computers. You do not need to pay for the software multiple times if you do this. Steve says Sorry no installing Lion without 10.6 on new drives ! This is the third email I’ve seen from Steve since WWDC. It looks like Steve must have sat through some discussion meetings since the emails he has replied to clarify items such as the discontinuation of MobileMe and the App Store installation of Mac OS X Lion. 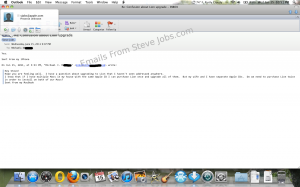 Emails From Steve Jobs.com reader Andreas Dantz was kind enough to write in about a recent email he received from Steve. With the removal of any physical media installation method for Lion, Andreas wondered how a clean installation would work if he bought a new hard drive. Would he need to first install Snow Leopard and then upgrade Lion on top of that? Or would there perhaps be an alternative to this? I just wanted to know if there will be a way to install Lion on a new HDD/SSD without previously installing 10.6? So just in case you thought there may be an alternative physical media installation method. Sorry, no, Apple was serious when they said that Lion would only be available through the App Store. This is pretty interesting since it means that Steve must have sat through the meetings where they discussed the implications of this move to a download-only upgrade. This email from Steve follows on from the last email a reader sent in. Along the same lines, the user is concerned that they will have no bootable media for a clean install of Lion. It has been noted on several other blogs that OS X Lion does create a separate recovery partition to enable clean installs from a working system. In the event of a total hard disk failure where the only option is a full re-install it does seem to be the case as Steve points out that the official reinstallation procedure involves first installing Mac OS X Leopard. Im really exited about Lion, but Im a bit anxious about the absence of any physical media in the event of a crash where I need to do a clean install. Will Lion still provide a way to make a bootable image in the event that I need to start from scratch? You can clean install Snow Leopaard [sic] first. Today Apples Board released a statement that company co-founder and longtime CEO Steve Jobs has passed away. This is an unofficial fan website but it will also remain as a tribute to Steve Jobs. Please feel free to leave any comments you wish in this post. CUPERTINO, Calif. — We are deeply saddened to announce that Steve Jobs passed away today. A great way to remember Steve is to via his upcoming biography Steve Jobs by Walter Isaacson. It will be released on October 24, 2011 and would also make an excellent Christmas gift for any Apple fan you may know. When Apple co-founder Steve Jobs passed away, Apple immediately paid its own tribute to its talismanic leader by posting a memorial page on its website, also asking those that wanted to pay their respects to email a specially created email address with their thoughts and tributes to Jobs. Over a million people from all over the world have shared their memories, thoughts, and feelings about Steve. One thing they all have in common — from personal friends to colleagues to owners of Apple products — is how they’ve been touched by his passion and creativity. You can view some of these messages below. And share your own at rememberingsteve@apple.com. Apple website visitors can still send their tributes, which will in-turn be posted to the website should they be approved. Steve Jobs died on October 5 after a long battle with Pancreatic Cancer. Speed Up Your Mac Right Now ! Get Rid of Nasty Duplicate Files!